Sturridge has joined West Brom on loan in search of the regular Premier League starts that have been denied to him at Liverpool. LIVERPOOL STRIKER DANIEL Sturridge has joined West Brom on loan for the rest of the season. The 28-year-old England international has struggled for regular starts this season, with Roberto Firmino firmly established as Liverpool’s favoured option at centre-forward under Jurgen Klopp. Sturridge began Gareth Southgate’s tenure with the national team as first choice, but his struggles and lack of minutes at club level have persuaded him to seek pastures new, with the World Cup in Russia on the horizon. The Baggies won 3-2 at Anfield to knock Liverpool out of the FA Cup on Saturday and Sturridge will be available for Albion’s remaining games in the competition having not been used in round three or four by his parent club. The former Manchester City youngster has also played for Chelsea, as well as Bolton Wanderers, and boasts an impressive record of 74 Premier League goals in 114 top-flight starts over the course of a career dogged by fitness problems. Alan Pardew’s side travel to face league leaders Manchester City on Wednesday and have been drawn to host Southampton in the fifth round of the FA Cup. 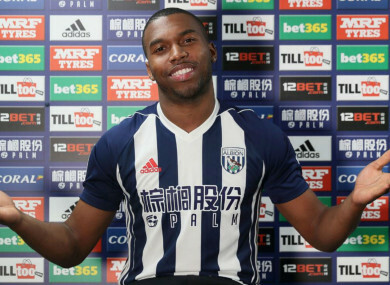 Birmingham-born Sturridge is West Brom’s second signing of the day, following the loan arrival of Egypt defender Ali Gabr from Zamalek, and he is happy to be back in his home region. “This felt like the right fit,” Sturridge told West Brom’s official website. Pardew added: “This is a big coup for us and I speak for my staff and my players and say ‘thank you’ to Daniel for agreeing to assist us in league and cup. Despite taking four points from their past two league games, West Brom sit second bottom and three points from safety. Email “Daniel Sturridge completes loan switch to West Brom”. Feedback on “Daniel Sturridge completes loan switch to West Brom”.